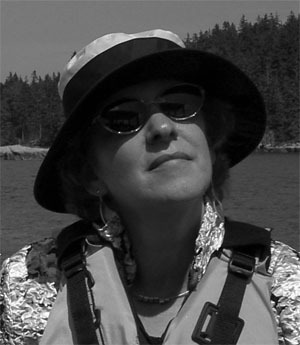 Judith Shatin is a composer, sound artist, community arts partner and educator. She is currently William R. Kenan, Jr. Professor and Director of the Virginia Center for Computer Music, which she founded at the University of Virginia. An innovator in both music and teaching, she was awarded �Teacher of the Year� by the University�s Z Society. Her pioneering work also led to appointments as Senior Fellow in UVA�s Center for Literary and Cultural Change, and Associate Fellow in the Institute for Advanced Computing in the Humanities. Shatin is an intrepid sonic explorer whose music spans chamber, choral, dance, electroacoustic, installation, multimedia and orchestral genres. She is as likely to call on the sounds of a weaver working on wooden looms , the chink of a fork on a cup, or the machine sounds of a coal mine as she is to draw on both traditional and extended techniques of acoustic instruments. Her project is to create poetic sonic experiences, no matter what the sound sources. The results have been featured at festivals including the Aspen, BAM Next Wave, Grand Teton, Havana in Spring, Moscow Autumn, Seal Bay, Ukraine, Soundways (St. Petersburg) and West Cork. Orchestras that have performed her music include the Denver, Houston, Illinois, Knoxville, Minnesota, National and Richmond Symphonies. A recipient of four National Endowment for the Arts Composer Fellowships, she has been honored with awards from the American Music Center, Meet the Composer, Met-Life Creative Connections, the New Jersey State Arts Council and the Virginia Commission for the Arts. A two-year retrospective of her music in Shepherdstown, WV was sponsored by the Lila Wallace-Readers Digest Arts Partners Program and culminated in her folk oratorio, Coal, scored for Appalachian Ensemble, chorus and electronics. Commission highlights include those from the Barcelona New Music Ensemble, the Dutch Hexagon Ensemble, Kronos Quartet, Library of Congress, and the National Symphony Orchestra�s Hechinger Commission. Twice a fellow at the Rockefeller Center in Bellagio, residencies include Bramshaus (Germany), La Cit� des Arts (France), Mishkan Amanim (Israel), and, in the US, the MacDowell Colony, Virginia Center for Creative Arts and Yaddo. Educated at Douglass College (AB), The Juilliard School (MM) and Princeton University (PhD), Shatin is in demand as a master teacher. She has taught at the Wellesley Composers Conference and as BMI composer-in-residence at Vanderbilt University. CD�s devoted to her music include Dreamtigers (INNOVA) and Piping the Earth (Capstone) and her music is featured on numerous other labels. An advocate for her fellow composers, Shatin has been a board member of American Composers Alliance and the League of Composers/ISCM, as well as President of American Women Composers. She is currently on the Advisory Board of Everglade Recordings and the International Alliance of Women in Music.